Our range of automated guillotines offering a genuine alternative to the traditional ream cutter. Fully automated finishing devices that offer green button technology. Remove bottlenecks, increase productivity, be less reliant on staff. We offer a complete range of automated guillotines also known as Cutter/Creasers or Slit/Cut/Crease (SCC) machines. Fully automated finishing solutions including the award winning Duplo DC616 and Duplo DC616 Pro as well as our own brand Multi-Card Elite. Automated guillotines or full all in one finishing devices have become common place in the print environment over the last decade. The trend was started with simple automated business card production machinery based around desktop designs for A4 and SRA3 sheets. These early machines used a fixed template or pattern of either 10 up and 21 up business cards in the standard 55 x 85mm setup to quickly and accurately produce hundreds of cards per hour, taking many hours of work away from the guillotine operators. These simple solutions where quickly expanded with multiple configurations enabling them to produce other card sizes. This posed the question - Why buy separate cutting and creasing machines when you can do both (and much more!) with an automated Cutter Creaser? These systems can be utilised as a business card cutter, a dedicated guillotine, a paper creaser, a perforator, and a rotary die cutter. Save money, save time, expand your capabilities and benefit from the quick set up of our automated Guillotines & Cutter Creasers. When choosing this option of guillotine or cutter creaser, the first step is to consider how frequently it will be used, and on what scale. Entry level business card cutters for SRA3 are limited so our range starts with probably the best selling Automated Guillotine on the UK market which is the Duplo DC616 and Duplo DC616 Pro. These two models offer extensive capabilities wrapped up in a compact, easy to use and ultra reliable package. The standard Duplo DC616 is controlled via the integrated LCD Display whilst the Pro model adds a touch screen PC Controller to the already impressive format. The Duplo DC616 is the ideal option for low to medium volumes only simply due to the processing speeds being quite low with production capabilities up to 11 sheets per minute the limitation. If you require higher production speeds or are working constantly to tighter deadlines then we have a number of options to fill this void. The Obeli Multi-Card Elite offers everything you get from the Duplo DC616 Pro including a touch screen controller. 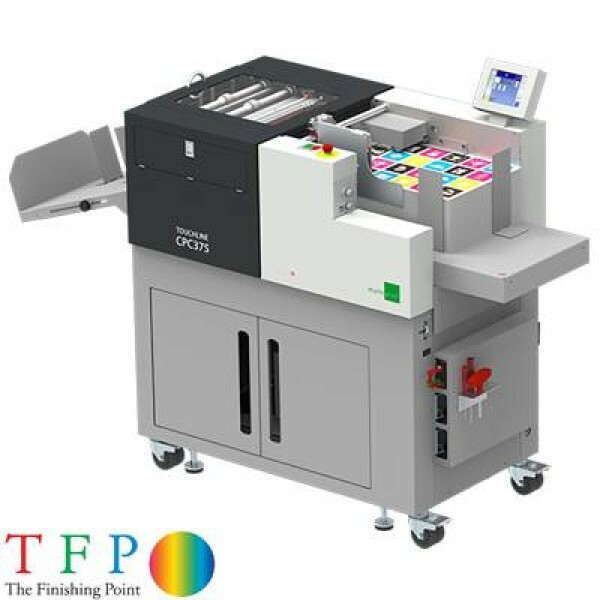 However the Multi-Card offers a significant increase in both productivity and flexibility with production speeds up to 25 sheets per minute possible and class leading business card production of near 14 sheets per minute without any loss of accuracy. Further to this the Multi-Card Elite also has the added benefit of plug and play tooling for stop/start perforation, full length perforation, extra slitting heads, linear creasing and kiss cut. Duplo take this a step further with the introduction of the DC646 Pro and range topping DC746 Pro offering a programmable automated finishing solution capable of slitting, cutting, creasing, perforating both continuously and stop start in both directions as well as a host of other modules which simply bolt in to place. All this done at incredible speeds of up to 50 sheets per minute with pin point accuracy and multiple cameras to keep registration consistent at all times.